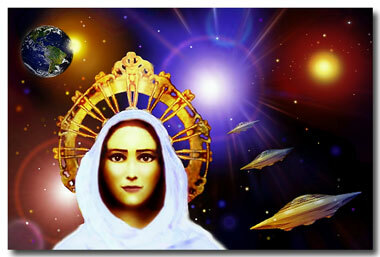 SOL-O-MAN/MARY: My beloved team of light workers, you know me as Sol-O-Man/Mary, Mother of the Americas. I come at this opportune time because I have been tied in effectually in these new hieronic measures in preparation for the travels we shall undertake soon. I am aboard Dr. Hannibal’s mother ship #1235, having been positioned in synchronization through Dr. Hannibal’s equipment with this I Am Nation triangulated team for a new level of infusion of light enfoldment. 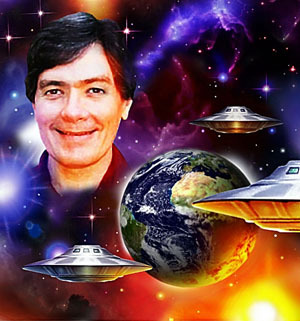 I shall be with my travelers every step of the way during the South America Mission, boosted through these hieronic implementations so that I may reach out from the etheric realms through all astral kingdoms and unto the Earth, where my light workers await my herald for the Second Coming. Because many throughout these continents venerate the roles that I portray in these Latter Days for the Second Coming program, I am able to subsume their consciousnesses, injecting these higher frequencies of light through these ready akashic pathways. You, my beloved charges, will carry this thought and this encapsulated consciousness with you wherever you land and set foot within these realms of my responsibilities. All of this will continually be reinforced through Dr. Hannibal’s hieronic teams so that we can make the highest use of your effectiveness as light workers incarnated on the physical plane, carrying out these works. All who tune in with me may be incorporated in this grounding as we pinpoint our projections primarily through my beloved disciple Zan-Landa/Robert and his loving teammate and partner, MariLyn. Through these testing procedures and preparations, we signal you with these tryouts as we work out any last-minute kinks before your departure. But much has been readied beforehand, and this is a simple matter of tweaking the force field, perfecting our methods of transfer as we may employ them during the South America Mission. Let this be another herald for the Second Coming of my beloved son, Sananda/Jesus the Christ; for all on Earth are being unified step-by-step for his return. In parting, I give you my grace, which comes through me from Holy Father-Mother God. Amen. Sol-O-Man/Mary, symbolizing the Divine Mother energy within you and within all mankind. Go in peace. Amen. Note: In our weekly Hierarchal Board meditation, I was contacted by a hieronic beam from Dr. Hannibal’s mother ship. The Conrad space team, assigned for our protection at I Am Nation headquarters, augmented the relay. Thus began an extensive session of hieronic conditioning, which produced in me a variety of heightened auric and physical sensations: accelerations of my upper chakras, but also my solar plexus; rapid breathing and heartbeat; tingling in my hands, which were levitated periodically to assist the electromagnetic infusion of light. My heart chakra particularly was locked in a viselike grip, while my throat and facial muscles were manipulated repeatedly, in preparation for a potential vocal channeling. Despite these symptoms and lengthy gyrations, I was not informed of their specific purpose until long into the conditioning process. Then, to my complete surprise, Sol-O-Man/Mary appeared, softly enveloping the three of us with her divinely feminine essence, a mantle composed of undulating folds of white light. Enhanced by the new hieronic frequencies that have been introduced in recent weeks, her radiant presence emanated a tangibly unique vibration, a blending of her cosmic functions as Sol-O-Man with those she portrays as Mary the Mother. She relayed mentally that she was on board Hannibal’s ship #1235. Coalescing her hieronically boosted materialization, Sol-O-Man/Mary used universal sign language to identify herself to Dr. Robert and MariLyn. With my left hand, she formed a Seventh Ray signature that in many respects mirrored Sananda/Jesus’ well-known J sign. She also positioned my left hand as a flat palm, facing outward, to project a pure stream of her cosmic energy. When all was fine-tuned, she signaled she was ready to channel. 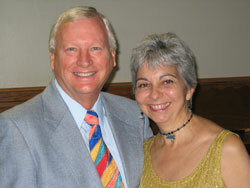 Dr. Robert and MariLyn depart for South America on October 13th. Launching into the continent via Panama, their six-week mission will include five major stops in Peru, Argentina and Brazil, with an overnight stay also in Chile. See “Master’s Plan for a Unified Earth,” channeled by St. Germain/Dr. Hannibal on August 31, 2011. In 1917, Mary appeared several times to the three children of Fatima: Lucia dos Santos and Francisco and Jacinta Marto. The last appearance, on October 13th, was witnessed by 70,000 people and involved the miracle of the “dancing sun.” According to channelings through Nada-Yolanda, that sky phenomenon was the manifestation of a spacecraft. Note also that Francisco Marto was an incarnation of St. Germain/Dr. Hannibal; hence, Mary doubly emphasizes her current tie-in with him for the South America Mission. Serendipitously, Dr. Robert and MariLyn start the mission on October 13th. Photos: (1) Mary of the Cosmos © by Hartmut Jager. (2) Dr. Robert and MariLyn, 2008, Mark-Age Archives. 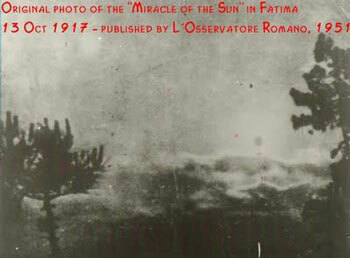 (3) Miracle of the Sun, October 13, 1917; published by L’Osservatore Romano, 1951. LISTEN TO PODCAST: Click on the “Play” button below to listen to the above communication, as recorded live on 9/7/11. This recording was released on I Am Network of Light tape #1030A, for the week of 11/6/11. Such peace and serenity flow through in the knowledge that beloved Sol-O-Man will be with us all the way. Such tremendous work is under way always in assistance for this beloved planet from all. We are truly blessed especially to our beloved I Am Nation! God bless us all!